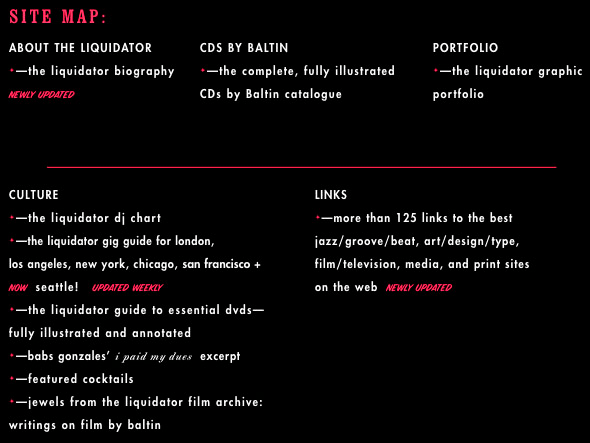 Welcome to liquidatorgraphics.com, conceived as a hub for those rare individuals who have developed a cosmopolitan and urbane yet soulful and raw aesthetic that can take in such divergent reference points as jazz-dance, Brazilian and Afro-Cuban rhythms, acid jazz, vintage British, Japanese, and Hollywood film, all graphic styles descended from the jazz and beat mindset from Reid Miles to Swifty, pulp writings, fine cocktails, and so on. Basically it’s an attempt to add to and support the lineage of the jazz-dance/acid jazz/nu jazz, et. al., (consult Straight No Chaser for definition) scene that I cherish (as much for the visual expression as the aural), and to introduce other potentially lost or neglected elements of color and content (some vintage, some contemporary, many filmic) into the blend to up the lustre quotient. And yes it’s also a crass attempt to drum up work for myself. That said, I hope you find it a potent and intoxicating brew. Obviously the portfolio and CD pages will be updated as I finish new work, but the Culture pages will function more as a magazine/resource, with the listings kept current and features added regularly, so visit often, and please pass on the link with abandon. Welcome to liquidatorgraphics.net, conceived as a hub for those rare individuals who have developed a cosmopolitan and urbane yet soulful and raw aesthetic that can take in such divergent reference points as jazz-dance, Brazilian and Afro-Cuban rhythms, acid jazz, vintage British, Japanese, and Hollywood film, all graphic styles descended from the jazz and beat mindset from Reid Miles to Swifty, pulp writings, fine cocktails, and so on. Basically it’s an attempt to add to and support the lineage of the jazz-dance/acid jazz/nu jazz, et. al., (consult Straight No Chaser for definition) scene that I cherish (as much for the visual expression as the aural), and to introduce other potentially lost or neglected elements of color and content (some vintage, some contemporary, many filmic) into the blend to up the lustre quotient. And yes it’s also a crass attempt to drum up work for myself. That said, I hope you find it a potent and intoxicating brew. 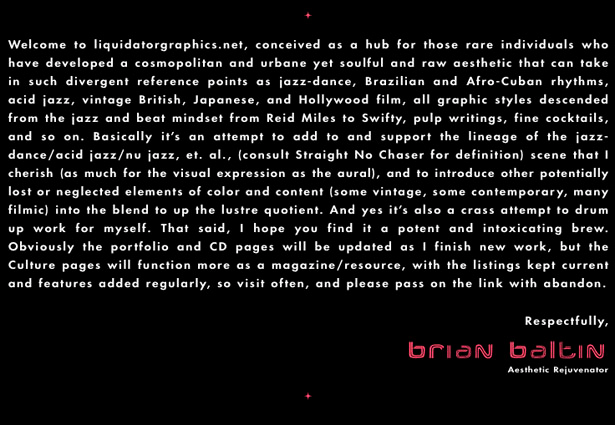 Obviously the portfolio and CD pages will be updated as I finish new work, but the Culture pages will function more as a magazine/resource, with the listings kept current and features added regularly, so visit often, and please pass on the link with abandon.